Let’s hope this one goes on to win at Cheltenham. Some readers may be wondering why someone with a great job, marvellous smile and loved by all like Luke was linked to a creature with such a moniker. It’s because of this encounter with racing’s greatest man. See below. Ha ha never gets boring, and talking of racing’s greatest man, word of a Barney Curley style multiple gamble was afoot. Apparently four horses from Miss Sheena West’s yard had been backed at big prices in multiples ‘all over the country’. The bookmakers’ PR machine had got into full swing telling of telephone number liabilities and how the industry was quaking. One on course layer had been told that the last bet one off-course firm had laid was a £50 Lucky 15 with each of the previously doubled-figured priced beasts at less than 2/1. I expect they’d send a car out every morning to pick whoever that was and give him a lift to their shop. The Racing Post’s Andrew King scoffed the way only he can and said there was no chance of the bet being landed. He’s not a man who gets splinters in his arse that’s for sure. Regardless of people’s opinions the gamble was going to make the afternoon interesting. The first two legs were here and the last two at Lingfield so they’d get all the real action if the first two won but still, the anticipation was there. The going was Heavy – Soft in Places so a real test and also a little bit perilous for punting, or so you’d think. The opening race saw Distracted backed from 10/3 into 11/4 and oblige by five lengths. One bookie ‘on the end for value’ laid a nasty £2200-£800 the winner which started his day off badly. Not much fun working out how much you have done in this weather. Next up was the much anticipated first leg of the gamble. Fintan was opened up at 3/1 on course. That would have looked very skinny had the circumstances been different but the on-course layers were taking no chances. Very prudent as it turned out as the money came for it forcing the books to submit under the weight of money. It was generally 9/4 at the off. Eyebrows were raised in some quarters when small off-course money also came into play, the general thinking was that they’d have waited to see the first leg won before getting involved. Easy to say if you aren’t the ones sitting on ‘millions’ of pounds in liabilities that’s for sure. They’d have been right though, Fintan was pulled up three out after being well-beaten long before that. The race went to Duke’s Affair the 11/2 ‘third in’ beating 6/5 jolly Very Intense by a length and thwarting a couple of decent bets in the process. The first leg of the gamble biting the dust was a bit deflating for those of us hoping to see some drama unfold. Still, at the morning prices if Landscape could win in the next, the Hague Print Management Handicap Hurdle, there was still a Trixie to be salvaged. The money came in for it, a steady torrent rather than lumps but enough to shorten 13/2 into a general 9/2 though if you shopped around you could have got slightly bigger on the extremities. If you had, your ticket would have been worth just as much after the race, bugger all. Landscape finished stone last beaten 105 and a bit lengths. The favourite Miles To Memphis was also beaten despite being backed from 11/4 £1100-£400 5/2 £1000-£400 into 2/1. It wasn’t a total bookie bonanza though as Paul Nicholls’ San Benedeto won the race, an eased up 7/2. There was a winning favourite and drama in the fourth when Andrew Thornton managed to get 4/5 jolly Alder Mairi home in first place despite a broken stirrup leather. Armaloft Alex went to greet the winning combination after the race and commented to Thornton that he’d not noticed any difference in his normal style of finish. Armaloft the smiling joker was tickled to report the tender jockey’s reply was ‘unrepeatable’. He needs another 17 to reach his target 1000 good luck to Andrew, let’s hope he gets them and that his nether regions soon recover. Biggest bet I heard about on course was a mere even carpet (£300) though I’m sure that punter appreciated the heroics. With word filtering through that the other duo in the ‘nationwide gamble’ were soundly beaten over at Lingfield the buzz had just fizzled out, a real anti-climax. The was a bit of punting action in the penultimate Lenny Roberts Memorial Trophy Novices’ Hurdle when Whataknight attracted support £2100-£600 and £1400-£400 but that stayed with the layers too. Sadly for them the race went to 7/4 favourite Final Nudge, one punter bagging a £700-£400. Despite all the excitement, mood at the meeting was seriously tempered by the news that veteran bookie Kenny Wager had passed away aged 84. Mind you, once over the initial shock and sadness everyone had a ‘Kenny’ story. I got a good few from Andy Smith of Festival Racing, all very funny and affectionate but far too rude for a family blog. Kenny was a real character and a much-loved part of the on-course bookmaking community, he’ll be greatly missed. As bookie Peter Houghton tweeted referencing Kenny’s favourite saying the past 30 years I’ve known him, ‘The game really is gone.’ RIP Kenny. I also write an exclusive ‘Tales’ for Racing Ahead Magazine each month, please support the magazine that supports me. 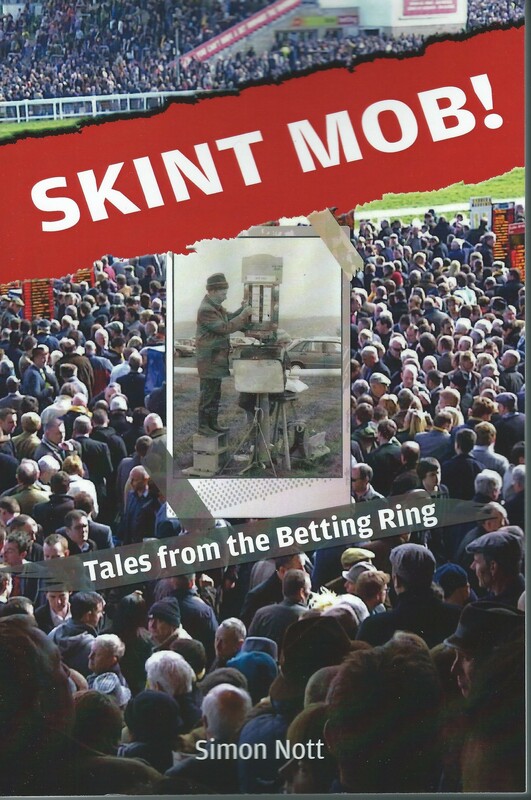 My book ‘Skint Mob – Tales From The Betting Ring’ is a book about the bookies, punters and other wonderful characters I have met in my time on racecourses. There have been some nice reviews. It’s also available on Amazon, Nook, Kobo and on Kindle.